To find the oldest building in Rotterdam, take a trip on tramline 4, to Hillegersberg, on a route that passes between the Bergsche Plassen, past Rotterdam’s most expensive properties. Here you’ll find a low hill, called ‘donk‘. Legend has it that it was built by a giantess called Hillegond. The prosaic explanation is that this is a remnant of the ice age, when the wind formed sand dunes in the polar landscape. Later, as the climate became warmer and wetter, the area became filled with clay and peat. The dry sandy bulges rising above the otherwise flat landscape offered a natural refuge from floods, and ‘donks’ like this were inhabited since prehistoric times. Coins and pottery found here testify that this particular donk has been used at least since the Roman era, some 2000 years ago, and the first records of a church here go back 1000 years. The current church dates from around 1300, built near a castle called Huis ten Berghe. 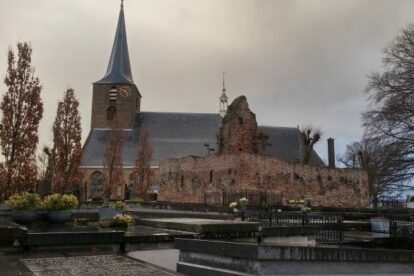 Both the church and the castle were demolished in 1426, during the Hook and Cod wars, the Dutch equivalent to the Wars of the Roses. The church was later rebuilt, but not the castle, the picturesque ruin of which still sits in the middle of the cemetery. The cemetery is open daily, and the church can be visited (besides the Sunday services) on Wednesday and Saturday mornings, although it would be best to check in advance, as the church may be in use for other events.